Enneagram and Faith: What are your deepest vulnerabilities? I had been through many difficult experiences in my life. I didn’t understand why this particular circumstance was the one pushing me over the edge. Though I knew I was off, and felt I needed help, the things I was struggling with seemed like things I should have been strong enough to handle on my own. My therapist answered the question for me in our second session. We all have fears. But some are so deep, we like to bury them beneath the others, with a few distractions piled on top for good measure. Vulnerabilities we try to avoid because they are the most difficult for us to handle. Now, here mine were, being dug up. Publicly. Of course I needed voices of reason and empathy to help me sort through what had been unearthed. The answer to that question is crucial to our spiritual growth. It deeply impacts our ability to extend empathy and love. When we dig out our vulnerabilities, we also unearth our ability to extend grace. I am shuffling my body as I write this. My anxious energy is pushing its way through my toes and my fingers, trying to get me to avoid what I know needs to come next. It is always easiest to write about my type as an example. Which means I need to share that thing I try to keep buried. When friends doesn’t have time to get together, I fight with the fear of what that means about the value our friendship plays in their lives. After getting together with a new friend, I fight with the fear of whether I said or did things that would keep that person from wanting to see me again. Because of this vulnerability about rejection, there are things I feel like I should be able to handle that crush me. But there are other places where someone else might get crushed, but I can handle it. I’ve been told I’m good at receiving criticism, which is the vulnerability that can devastate a type 1. I am prone to disregarding my own needs for the sake of helping others, so the fear of being neglected that a type 9 struggles with feels foreign to me. A type 5 fears looking foolish, but I’ve fallen down that stairs enough in my life to have gotten over that one years ago. We all have our junk. 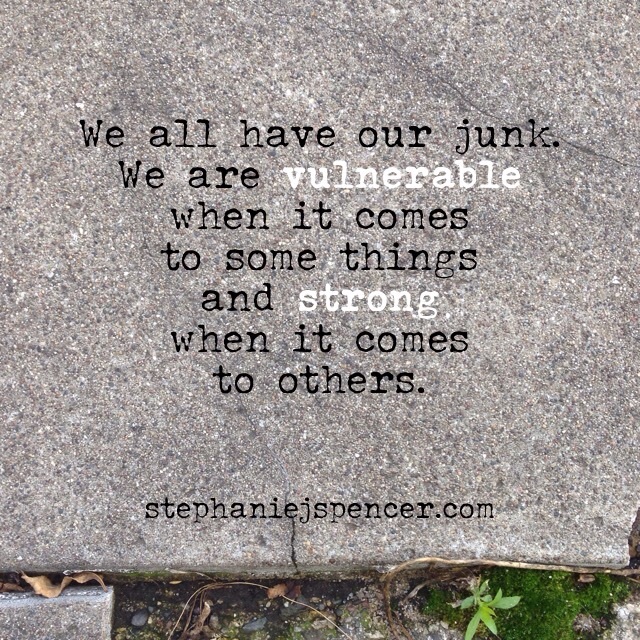 We are vulnerable when it comes to some things and strong when it comes to others. It does me no good to compare, and wonder why that person over there is so much stronger than me. We cannot just “get over” our struggles, nor can someone else just “get over” theirs. Comparing is another way to avoid what needs to be done. We need to do the hard work of admitting and facing our vulnerabilities. For me, this means putting practices in my life that remind me of my belovedness. When I know that at my core I am not rejected, but loved, it helps me face the relationships in my life with less manipulation and fear. Other people may be able to read one book about God’s love and feel like it’s covered. I read books like Life of the Beloved by Henri Nouwen and Surrender to Love by David Benner on repeat. I return to the book of Psalms and the Gospel of John over and over again. I put quotes from John O’Donohue on my email and in Evernote so I can return to them whenever I need them. I wrap up in the prayer shawl someone knit for me and feel held by unconditional affection. Lately, thanks to the enneagram, I have been more conscious of facing the rejection questions head-on with love and grace. I’ve noticed they’re getting a little softer. I might even be able to press publish without fearing how I came across in my self-disclosure and whether you will read me again. Maybe. Do you know what your deepest vulnerabilities are? How might you be able to face your them today? Want help figuring out your enneagram type and finding the answers to those questions? Remember to check out my enneagram coaching page for details of how I could be a voice of reason and empathy for what is getting unearthed in your life.